A logic puzzle is a puzzle deriving from the mathematics field of deduction. The logic puzzle was first produced by Charles Lutwidge Dodgson, who is better known under his pen name Lewis Carroll, the author of Alice's Adventures in Wonderland. In his book The Game of Logic he introduced a game to solve problems such as confirming the conclusion "Some greyhounds are not fat" from the statements "No fat creatures run well" and "Some greyhounds run well". Puzzles like this, where we are given a list of premises and asked what can be deduced from them, are known as syllogisms. Dodgson goes on to construct much more complex puzzles consisting of up to 8 premises. In the second half of the 20th century mathematician Raymond M. Smullyan has continued and expanded the branch of logic puzzles with books such as The Lady or the Tiger?, To Mock a Mockingbird and Alice in Puzzle-Land. He popularized the "knights and knaves" puzzles, which involve knights, who always tell the truth, and knaves, who always lie. There are also logic puzzles that are completely non-verbal in nature. Some popular forms include Sudoku, which involves using deduction to correctly place numbers in a grid; the nonogram, also called "Paint by Numbers", which involves using deduction to correctly fill in a grid with black-and-white squares to produce a picture; and logic mazes, which involve using deduction to figure out the rules of a maze. 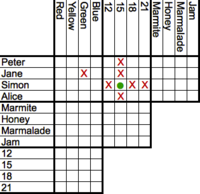 A logic puzzle grid, with the information that only Simon is 15 and Jane does not like green filled in. Another form of logic puzzle, popular among puzzle enthusiasts and available in magazines dedicated to the subject, is a format in which the set-up to a scenario is given, as well as the object (for example, determine who brought what dog to a dog show, and what breed each dog was), certain clues are given ("neither Misty nor Rex is the German Shepherd"), and then the reader fills out a matrix with the clues and attempts to deduce the solution. These are often referred to as "logic grid" puzzles. The most famous example may be the so-called Zebra Puzzle, which asks the question Who Owned the Zebra?. Common in logic puzzle magazines are derivatives of the logic grid puzzle called "table puzzles" that are deduced in the same manner as grid puzzles, but lack the grid either because a grid would be too large, or because some other visual aid is provided. For example, a map of a town might be present in lieu of a grid in a puzzle about the location of different shops.